It's rare that I read an entire series. However, Leigh Bardugo's The Grisha Trilogy grabbed me from the beginning and didn't let go. Even more unusual is the fact that I can't pick a favorite among the three books: Shadow & Bone, Siege & Storm, and Ruin & Rising. 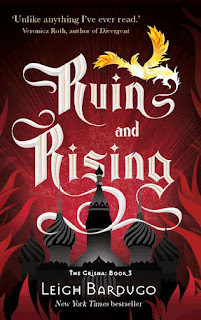 Each is incredible in its own way, which is why I'm going to discuss the entire series as I talk about Ruin & Rising, the brilliant finale. A quick review. The series follows Alina Starkov, a young cartographer whose life takes a drastic turn when she discovers that she is the one-and-only Sun Summoner, meaning that she can control light. Due to this unique ability, she's courted by the Darkling, who--you guessed it--can control darkness. He's also the leader of the Second Army, the army of Grisha (people with magic powers). He needs Alina in order to destroy the Fold, a dangerous shadowland that splits the country in two. We quickly learn that the Darkling may have less-than-admirable plans -- and it's up to Alina to stop them. Essentially, this conflict carries all three books. Okay, so let's focus on RUIN & RISING. I admit this one gets off to a slow start. Alina & Co. are the prisoners of the Apparat, the crazed priest, and it takes a few chapters for them to break away. It's then that the story picks up -- specifically when Sturmhond arrives on the scene. Let's look at that, shall we? "I saw the prince when I was in Os Alta," said Ekaterina. "He's not bad looking." "Brave in battle, smart as a whip." Now the voice seemed to be coming from above us. Luchenko craned his neck, peering into the trees. "An excellent dancer," said the voice. "Oh, and an even better shot." "Who--" Luchenko never got to finish. A blast rang out, and a tiny black hole appeared between his eyes. "Don't say it," muttered Mal. Of course, the best part about that scene is the shout-out to Sturmhond's catchphrase, "When people say impossible, they usually mean improbable." As usual, he breathes life and joy into the story, which takes off as Team Avatar goes in search of the final amplifier. The way Bardugo treats the final amplifier is BRILLIANT. I won't spoil it, but I'll say that I did not see it coming. I was unprepared. And it shows just how much it will cost Alina to defeat the Darkling. Oooh, the Darkling. Wonderful, as usual, and definitely one of the best villains I've ever read. I was rooting for him. Not to win, but to find redemption. Throughout the series, he becomes increasingly awful, yet he retains so much of his humanity in his respect for Baghra, his relationship with Alina, and his conviction that he's doing the best thing for his country. Now I am going to spoil things. So SPOILER ALERT. His death was one of the best scenes in the entire series. It encompasses his bizarre relationship with Alina perfectly: in their weird way, they do care about each other deeply. I sobbed all over the place. I knelt beside him. The nichevo'ya had left off their attacks. They circled and clattered above us, unsure of what to do. I thought I glimpsed Nikolai above them, arcing toward that patch of blue. "Alina," the Darkling repeated, his fingers seeking mine. I was surprised to find fresh tears filling my eyes. He reached up and brushed his knuckles over the wetness on my cheek. The smallest smile touched his bloodstained lips. "Someone to mourn me." He dropped his hand, as if the weight were too much. "No grave," he gasped, his hand tightening on mine, "for them to desecrate." "All right," I said. The tears came harder. There will be nothing left. He shuddered. His eyelids drooped. "Once more," he said. "Speak my name." He was ancient, I knew that. But in this moment, was just a boy--brilliant, blessed with too much power, burdened by eternity. His eyes fluttered shut. "Don't let me be alone," he murmured. And then he was gone. Ugh, it's perfect. SO PERFECT. And, I mean, super depressing because I was Team Darkling the entire time, but really, it couldn't have ended any other way. All in all, this is perhaps the best YA series I've encountered in recent years. Pick it up. You won't regret it. And make sure to check out Leigh Bardugo's next book, Six of Crows, coming this Fall! 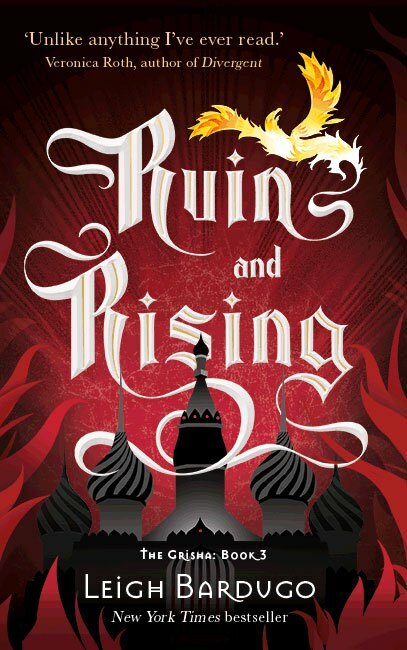 Find Ruin & Rising on Amazon and Barnes & Noble!